On Nov. 22, the 50th anniversary of the assassination of President John F. Kennedy, the Newseum hosted "JFK Remembrance Day," featuring a number of daylong JFK-themed discussions with authors, journalists and filmmakers. In this discussion, historian James Swanson, author of the new book "End of Days: The Assassination of John F. Kennedy" talked about the impact of that day. It was a good thing I was there. Newseum disappointed me, supposedly being for the First Amendment, as being a vehicle for the tired lone gunman theory. End of Days by James Swanson is a rehash of the official nonsense we have heard for 50 years, and that about 70% of Americans do not believe. Swanson discounts the 1979 House of Representatives Special Committee on Assassinations, that conclude there were "at least two gunmen" involved in the JFK assassination, and that a shot came from the front, near the Grassy Knoll. I challenged him in the Q&A session after his talk and am preparing a video. I asked him if he would be willing to debate you, Roger Stone, or Jesse Ventura. He refused saying he would not debate those with "religious views" of the assassination (a cop out). I do not want him to profit from his propaganda book, but decided to buy one to help me write a rebuttal exposing his b.s. It could make a good topic for The Real Deal. Swanson exaggerates and claims things out of the blue as if it was established evidence. On page 173, he claims that "several witnesses either saw Oswald shoot Tippit or flee the scene." Swanson does not name or reference the witnesses. He uses the word "or" to fudge the impression that there were "several witnesses" to the shooting. Swanson fudges further by claiming "One man heard him mutter 'poor dumb cop'" but again does not name the alleged witness. That is because there were no reliable witnesses to the shooting within 1 block. How could anyone hear a mutter from a block away? If anyone asks him a tough question, he says "it is in poor taste to discuss the assassination on this day when the country and his wife and children lost John Kennedy" - even though he is the one talking to the press about his book about it. I pointed out to the Curator that their exhibit about the Zapruder Film has his actual camera on display, but conveniently leaves out the frame where JFK's skull fragments are going back and to the left. This movie is just more smoke screen and should be boycotted. The Mafia could not get JFK to go to Dallas in the first place, remove the limousine bubble top, prevent the National Guard from helping the Secret Service, keep SS off the car, alter JFKs autopsy, hide his brain, etc. Remember the words from Oliver Stone's Mr. X (Col. Fletcher Prouty): "Why was Kennedy killed? Who benefited? Who has the power to cover it up?" Former U.S. Secret Service Agent Abraham BOLDEN was the first African American Secret Service agent to serve in the White House, personally appointed and literally hand-picked by President John F. Kennedy to the White House detail.Agent Abraham Bolden reported overt racism by his fellow agents and outright hostility toward the "n------loving president," quoting fellow Secret Service agents on the JFK detail. In addition to enduring all manner of personal indignities, he was concerned at the lack of professionalism in those assigned to protect the president and reported his concerns. He was told, "OK. Thanks" by his superiors. When the problems weren't addressed, Bolden requested transfer back to the Secret Service office in Chicago. Abraham Bolden speaks at JFK Lancer. Abraham Bolden paid a heavy price for trying to tell the truth about events involving the man he was sworn to protect -- JFK -- that became mired in National Security concerns. Bolden still lives in Chicago, and has never given up trying to clear his name. Will Abraham Bolden live to finally see the justice so long denied to him? 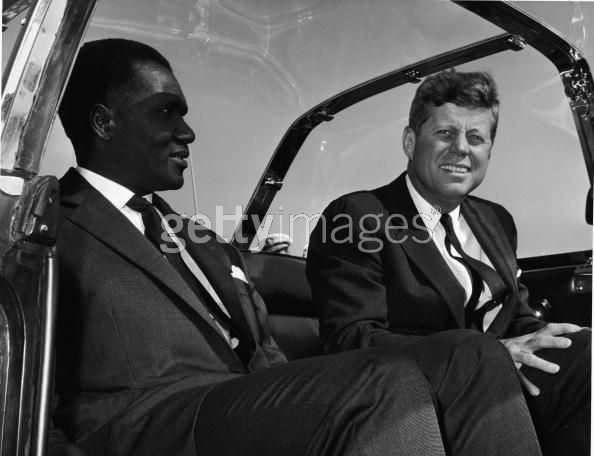 After the assassination, he went to Washington on his own dime and reported what he saw to the Warren Commission. For his trouble -- and despite an exemplary record as a Brinks detective, Illinois State Trooper, and Secret Service agent -- Bolden was framed by the government using a paid informant's admitted perjury and spent a long time in prison. The government also drugged him and put him into psychiatric hospitals.His real crime was telling the truth. Americans know the Truth: the country hasn't been the same since Nov. 22, 1963. President Kennedy kept the nation out of Vietnam and started toward the moon. Imagine what the New Frontier could have become for us today? Certainly would not be a time where "money trumps peace." George H. W. Bush involved in the murder of J.F.K.